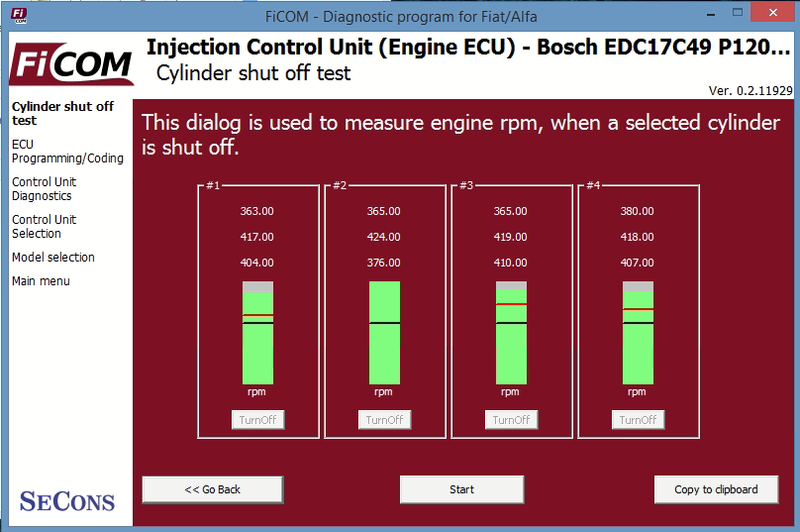 The test measures individual cylinder speed based on individual cylinder shut-off. No special tools are required to perform the test, no engine component disassembly is needed. This is pure OBD-II diagnostics test. The test window display measured values and bargraph for each cylinder (minimum, maximum, and current - or last - value). Bargraph shows absolute rpm range for each cylinder, all graphs (cylinders) have same scale and range. Green part shows rpm range for each cylinder. Black line shows average cylinder speed value, red line current speed value.